Vegetation restoration can dramatically affect soil carbon (C), nitrogen (N) pools and microbial communities. Yet, it is uncertain what effects of vegetation restoration have on autotrophic bacterial community and associated C-fixing potential. To investigate the responses of autotrophic bacterial community and microbial C-fixing rate to vegetation restoration of eroded agricultural land, three abandoned croplands (ES1, ES2 and ES3) and two secondary grasslands planted with Coronilla varia (GS1 and GS2) in the Qiaozi watershed of Chinese Loess Plateau were selected, and high-throughput sequencing and 13C stable isotope labeling were applied in this study. Results showed that vegetation restoration significantly (P < 0.05) improved soil C and N contents while reduced soil moisture level. 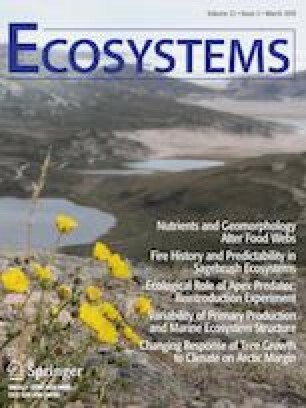 Total autotrophic bacterial abundance and species diversity in nutrient-rich secondary grasslands were significantly (P < 0.05) lower than those in nutrient-poor croplands. However, positive responses of obligate autotrophic bacteria, such as Alkalililimnicola and Synechococcus, to vegetation restoration were observed. Correlation analysis showed that autotrophic bacterial abundance and diversity were positively (P < 0.05) correlated with soil moisture, while negatively (P < 0.05) correlated with soil C and N nutrients. Microbial C-fixing rate ranged from 0.621 to 1.414 Mg C km−2 y−1 and the maximum value was observed in the ES3 site, followed by the ES1 site (1.088 Mg C km−2 y−1). Microbial C-fixing rate in abandoned cropland was significantly (P < 0.05) higher than that in secondary grassland, and it was positively influenced by autotrophic bacterial abundance and diversity. Overall, vegetation restoration of eroded agricultural land has negative impacts on autotrophic bacterial community and microbial C-fixing potential. In arid and semi-arid regions, great transpiration loss induced by vegetation restoration may inhibit autotrophic bacteria growth, and which further reduces the potential of CO2 fixation by autotrophic bacteria. ZWL and CXD designed the study; HBX performed research and wrote the paper; LL and JC analyzed data and wrote the paper; BH, XDN and CL contributed to manuscript development; DYW and JYJ contributed to field work. The online version of this article ( https://doi.org/10.1007/s10021-019-00369-7) contains supplementary material, which is available to authorized users. This work was financially supported by the National Key Research and Development Program of China (2017YFC0505401), the ‘Hundred-talent Project’ of the Chinese Academy of Sciences and the National Natural Science Foundation of China (41271294). We would like to thank Hao Peng of the Hunan University for the soil sample collection and Zhilin Pei of the Institute of Soil and Water Conservation CAS and MWR for the output of Figure 1.